As a dietary supplement for healthy adults performing high intensity exercise, experienced and comfortable with high caffeine products, add ½ to 1 level scoop to 8 fl oz (240ml) of cold water, shake 5-10 seconds, and slam it back 30 minutes prior to workouts. First time users should try ½ scoop first to assess tolerance. Read, understand and follow the entire Warning before choosing to use. Do not consume within 4 hours prior to bedtime. Never exceed 2 servings per 24 hours. This product may not be appropriate for you. High caffeine content. Not recommended for children or pregnant or breast-feeding women. For use by healthy adults only, accustomed to and comfortable with high caffeine content products. Use at your sole risk. Never exceed suggested use. For occasional use only. Ensure to drink enough fluid before, during, and after exercise. Consult a health care practitioner prior to use: if you are taking lithium; if you have or your family has a history of high blood pressure, cardiovascular disease, glaucoma, depression or any mental illness or issues, prostate/urinary diseases, renal/kidney diseases; if you are attempting to increase physical activity; if you are taking any medication at all and especially if for cardiovascular diseases, erectile dysfunction, and/or blood thinners. Do not use if you have had a heart attack/myocardial infarction. Consumption with other stimulant containing foods, drinks, dietary supplements (e.g. including but not limited to bitter orange extract, synephrine, octopamine, ephedra), other drugs (e.g. ephedrine) which increase blood pressure, or with other caffeine-containing products (e.g. medications, coffee, tea, colas, cocoa, guarana, maté) is not recommended. Beta-alanine and niacin can cause a temporary flushing, tingling sensation of the skin. This product is not intended as a substitute for sleep. If hypersensitivity, chest pain or allergy occurs, discontinue use and consult a health care practitioner. This product is intended to be used to supplement the diet; not to be used as a substitute for a varied diet. A varied and balanced diet and healthy lifestyle are essential for good health. Do not use if packaging has been tampered with. 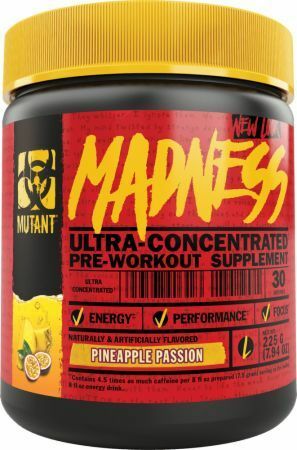 Mutant Madness has not been clinically studied - statements are based on corresponding individual ingredient’s known and/or typical claims and warnings. Packed by weight, not by volume. Settling of product occurs after filling. Do not consume silica packet. User assumes all liability & risk. KEEP OUT OF REACH OF CHILDREN. STORE IN A COOL, DRY PLACE. CONTAINS: Tree nut (coconut). Produced in a facility that also handles ingredients from milk, egg, wheat, peanut, soy, tree nut (hazelnut). Waxy Maize (Waxy Corn) Starch (For Anti-Clumping), Rice Starch, Natural & Artificial Flavors, Less than 2% each of the following: Calcium Carbonate, Sucralose, Silicon Dioxide, Red Beet Powder, Potassium Citrate, Tricalcium Phosphate, MCT Oil (Fractionated Coconut Oil), Magnesium Oxide, Rebaudioside-A (from stevia leaf extract). Waxy Maize (Waxy Corn) Starch (For Anti-Clumping), Rice Starch, Natural & Artificial Flavors, Calcium Carbonate, Less than 2% each of the following: Silicon Dioxide, Sucralose, Potassium Citrate, Salt, Tricalcium Phosphate, MCT Oil (Fractionated Coconut Oil), Beta-Carotene, Magnesium Oxide, Red Beet Powder, Rebaudioside-A (from stevia leaf extract). Waxy Maize (Waxy Corn) Starch (For Anti-Clumping), Rice Starch, Natural & Artificial Flavors, Less than 2% of each of the following: Sucralose, Potassium Citrate, Calcium Carbonate, Silicon Dioxide, MCT Oil (Fractionated Coconut Oil), Tricalcium Phosphate, Magnesium Oxide, Beta-Carotene, Rebaudioside-A (from stevia leaf extract).